Ship Notes: Item in Stock, Limited Quantities!! $1,889.24 with Fast Shipping and 1-Year Warranty on Parts and Paid Labor. BEST DEAL! New Machine, Perfect for small to medium grocery stores, restaurants, retailers and churches. Easy to use and operate! Includes On-Board Charger and Rechargeable GEL Battery Maintenance Free. Pad driver and brush NOT included. 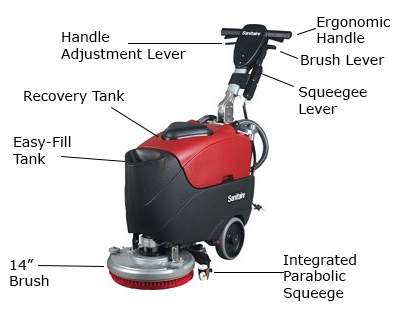 The Sanitaire SC6200A is a 14 Inch Walk Behind Auto Scrubber, It' is a compact and powerful, 3.5 gallon solution tank and 4 Gallon removable recovery tank capacity, Rechargeable Battery-Powered auto scrubber designed for cleaning small- to medium-size floors. Designed with Adjustable Fold Down handle to maximize operator comfort and ease of use, small foot print for easy storage. The 14-inch cleaning path with eco-friendly low moisture system save on chemicals and water, allowing you to clean scrub and dry large areas before having to dump and refill. Sealed Rechargeable Deep Cycle Gel batteries (maintenance free) and an On-Board Charger come standard, provide 1.5-hour run time, and the capability to clean 11,300 square feet per hour, your floors will be clean and inviting to customers in no time. An incredibly low 68 dBA Sound Level allows for cleaning day and night. 14” Cleaning Path – Portable auto scrubber is designed to clean small-to medium-size bare floors in restaurants, retailers, medical offices and classrooms. 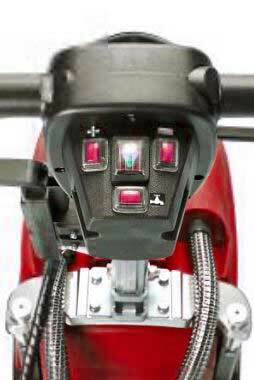 Cordless, battery operated-driven machine – Operates quietly, so it can be used any time. Rechargeable GEL Battery – Provides 80 minutes of run time. Built-in Dryer - Cleans and dry the floors in one pass, Eliminates the need for a blower. Quality You Expect. Features You Need. Sanitaire Promise of Performance One-Year Warranty which covers parts, materials, workmanship and labor. 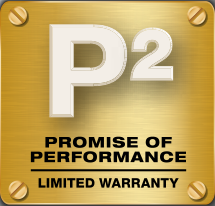 The Sanitaire Promise of Performance warranty covers parts, materials, workmanship and labor for a full two years. It is backed by a network of more than 1200 warranty service centers across the United States. 14" Cleaning path fits easily down narrow aisles. 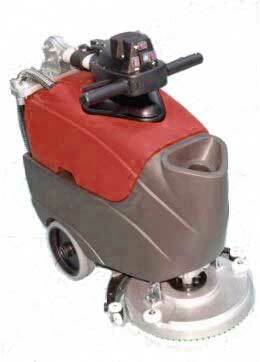 The Multi-Position handle allows the scrubber getting under counters. Save time and money by reducing training time required by your staff. Collapsible Folding handle on the back of the scrubber, makes storage easy. This 14” cleaning path portable scrubber replaces many a bucket and mop in cleaning small- to medium-size floors for restaurants, small retailers, medical offices and classrooms. The handle folds down for easy storage and movement of this versatile scrubber. This advanced walk behind auto scrubber sound level is 69 dB. 40" x 36" x 22"